The ability of small intestine cells to absorb nutrients and act as a barrier to pathogens is "significantly decreased" after chronic exposure to nanoparticles of titanium dioxide, a common food additive found in everything from chewing gum to bread, according to research from Binghamton University, State University of New York. Researchers exposed a small intestinal cell culture model to the physiological equivalent of a meal's worth of titanium oxide nanoparticles—30 nanometers across—over four hours (acute exposure), or three meal's worth over five days (chronic exposure). "Titanium oxide is a common food additive and people have been eating a lot of it for a long time—don't worry, it won't kill you!—but we were interested in some of the subtle effects, and we think people should know about them," said Biomedical Engineering Assistant Professor Gretchen Mahler, one of the authors of the paper. The paper, "Titanium dioxide nanoparticle ingestion alters nutrient absorption in an in vitro model of the small intestine," was published in NanoImpact. If you are chewing your implants into micro-particles, you might have something to worry about. Otherwise, you should be fine. The titanium implant is the socket screwed into your jaw. The denture that attaches is not titanium but is plastic and ceramic. 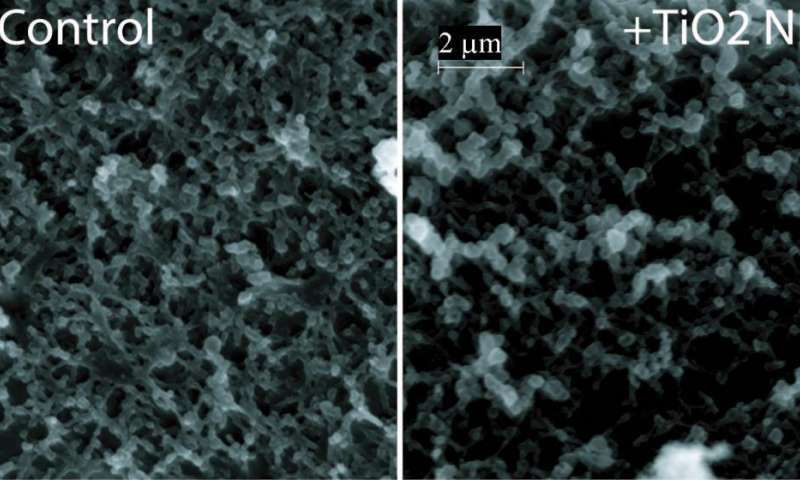 Intact titanium metal is not the same as these nano particles of titanium dioxide. The effect would be very different. Many material have an impact on cells when they come in as nano particles but not when they are in larger chunks.